June 2, 2012 0 comments on "The Best Snickerdoodle Recipe"
My mom used to make the best snickerdoodles. I embarrassingly have to admit that my boys don’t even know what snickerdoodles are! 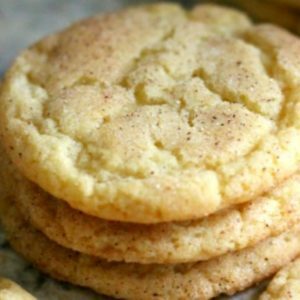 I ran across this great snickerdoodle recipe so I decided to see if my boys would eat them. Snickerdoodles are great any time of year, but they are always great during the holiday season. They are the perfect cookies for Christmas cookie exchanges. Preheat oven to 400 degrees. Mix together margarine, shortening, sugar, and eggs until well blended. Mix in flour, baking powder, baking soda, and salt. Chill dough for about 30 minutes. Roll the dough into balls the size of walnuts. In a separate bowl, mix 2 Tbsp sugar with 2 tsp cinnamon. The more cinnamon the better. Roll dough balls in cinnamon mixture. Place dough balls approximately 2 inches apart on an ungreased cookie sheet. Bake 7-9 minutes until lightly browned, but still soft (I baked mine for 7 1/2 minutes, and they turned out perfectly). Cookies will come out of the oven a little puffy and flatten while cooling. The original recipe says this makes 5 dozen cookies. I ended up with 4 dozen and a couple extra cookies. Well, the snickerdoodles were a big hit. My whole family loved them! And these truly are beautiful little cookies, there’s something about the perfectly shaped cookie.